I was looking for information on the Black Tortoise of Winter who played a significant role in Grace Lin’s When the Sea Turned to Silver, and it turns out that he’s pretty closely tied to a god called Xuanwu, a prominent deity in Taoism. In fact, the tortoise even shares the god’s name. I’ll get a little more into the association later, but for now I’ll give some basic information on Xuanwu. 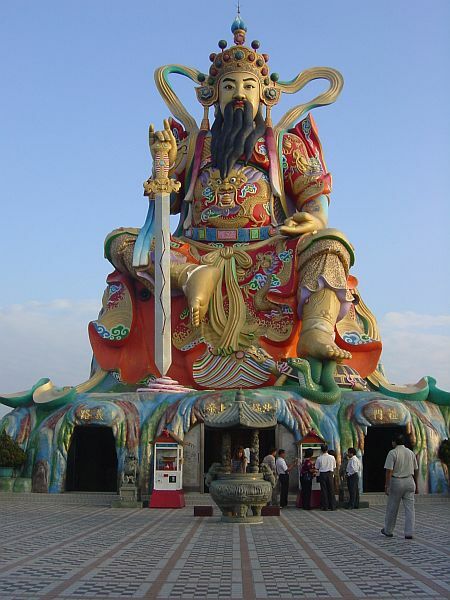 Although he has several functions, he seems to be most importantly regarded as a war god, and a patron of martial arts. His name even means “dark warrior,” although during the Song Dynasty, a taboo on the word xuan (I think it was part of the imperial ancestral name) led to him also being known as Zhenwu, or “true warrior.” He’s linked to the element of water and the direction north, which could be why he’s sometimes associated with winter as well. And since north is the direction from which the Mongols and other invaders would attack China, he was regarded as the one who protected the nation from them. That said, he remained popular even when the Mongols took over. One significant patron of his from after the Yuan Dynasty was the Yongle Emperor Xu Di, who attributed a victory to Xuanwu, and hence built temples in his honor. He’s sometimes regarded as being in charge of thunder and lightning as well. Xuanwu’s back story indicates that he was originally human, but managed to achieve immortality through study of the Tao. It seems that the earlier accounts make him a prince in the time of the Yellow Emperor, while the Manchu Dynasty later popularized the idea that he was a butcher who became upset over how many animals he was killing. He lived in the Wudang Mountains in Hubei for forty-two years, eventually becoming an immortal. The mountains are now famous as the site of a Taoist monastery where a certain style of martial arts is practiced, a rival to the nearby Buddhist Shaolin monastery. There are several different versions of the butcher story, but a common element in them is that he pulled out his stomach and intestines in order to become a god, the idea being that that he could not join the immortals until he removed his human parts. The version given by Wikipedia tells that he was washing the clothes of the disguised Guanyin, goddess of compassion, and she told him he needed to wash his internal organs as well. His stomach became a turtle and his intestines a snake, both of which were demonic and went on a rampage of terror. Xuanwu managed to subdue and tame them, hence overcoming his own demons (they were, after all, directly from his body), and they became his faithful followers and generals. Sometimes he’s shown stepping on them, though. 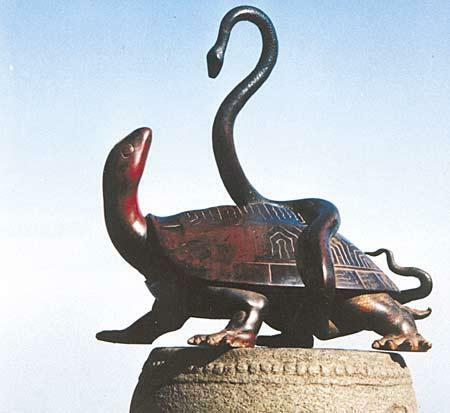 One of Xuanwu’s main symbols is a snake entwined around a tortoise. As tortoises live a long time, the symbol represented longevity as well as water and winter. The Black Tortoise is one of the four main animals identified as constellations by the Chinese, along with the Azure Dragon, the White Tiger, and the Vermilion Bird. Also, two mountains on opposite sides of a river in Hubei are known as Tortoise and Snake. 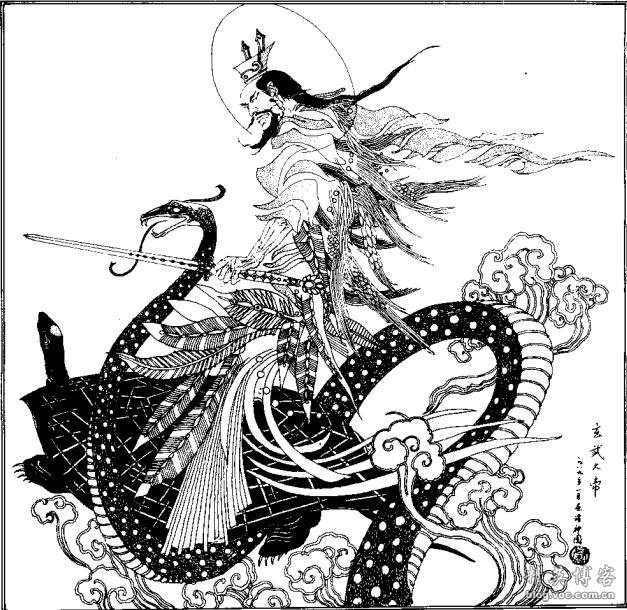 Also frequently appearing in depictions of Xuanwu is a sword that he holds very tightly, the legend being that he borrowed it from Lu Dongbin, one of the Eight Immortals, in order to kill a demon, and refused to give it back. Since it has the magical property of always returning to its master, Xuanwu won’t let it go. Xuanwu and his generals appear in Journey to the West, and I understand there’s also a series by Kylie Chan in which Xuanwu is kicked out of Heaven and lives as a businessman in Hong Kong. Is anyone reading this familiar with these books? This entry was posted in China, Chinese, History, Mythology, Religion, Taoism and tagged black tortoise of winter, constellations, demons, eight immortals, grace lin, guanyin, immortality, journey to the west, lu dongbin, manchu dynasty, martial arts, ming dynasty, mongols, snakes, song dynasty, when the sea turned to silver, wudang mountains, xuanwu, yongle emperor, yuan dynasty, zhenwu. Bookmark the permalink.